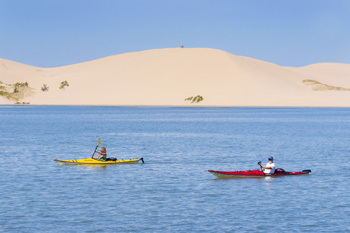 People who love adventure are happy when they choose Silver Lake State Park as their vacation destination. This 3,000 acre park is situated between Silver Lake and Lake Michigan, with Mears being the closest city. Over 2,000 acres of the park are sand dunes and the rest is mature forest land. Within the park you'll find hiking trails, an ORV area, fishing, swimming, boat launch, lighthouse and campground. The northern-most area of Silver Lake State Park is dedicated to off road vehicles. 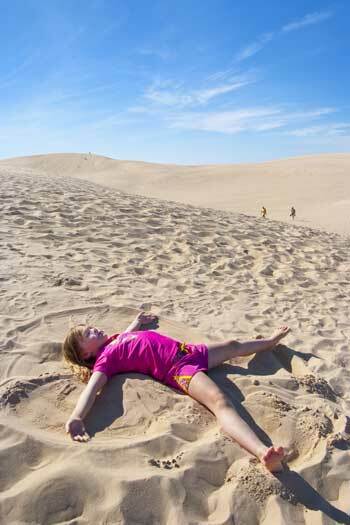 These dunes are the only ones east of Utah that allow private motorized vehicles from April 1-October 31. The 450 acres for ORVs make for an exhilarating ride, but care must be taken as the dunes shift with the wind and are constantly changing. Check with the Michigan DNR site for more information, such as rules and a map of the Silver Lake State Park ORV area. Silver Lake is a favorite of anglers for the selection of bass, northern pike, walleye, and crappie. Launch your own boat, or rent one from a local business. They carry a variety of watercraft, including ski boats, kayaks, paddleboats, canoes, rowboats, pontoons, wave runners...plus ski equipment and tubes. Nothing is better than spending a day out on Silver Lake fishing or boating. If you prefer to stay onshore, swimming is safe and calm...or head to the four miles of Lake Michigan shoreline. You get the best of both worlds at Silver Lake State Park. For those that enjoy camping, Silver Lake State Park has 200 modern campsites with electrical service and modern restrooms. Prices are $29 in-season and $20 off-season. Call (800) 447-2757 for reservations, or visit the official reservation website at Silver Lake State Park reservations. Just south of the Silver Lake State Park is the Little Sable Point Lighthouse. 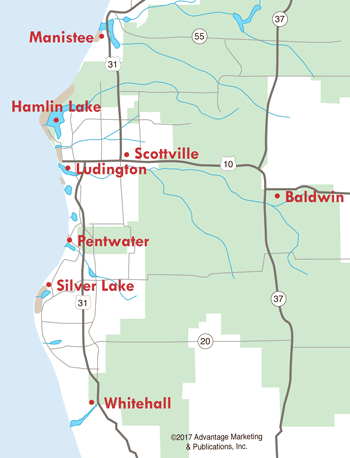 It's part of a group of lighthouses within a 30-mile region that includes Big Sable Point at the Ludington State Park and the North Breakwater Light in Ludington. Little Sable Point Lighthouse is open for tours from late May until the end of September. There is a pathway that leads from the parking lot to the lighthouse, allowing those in wheelchairs to access the light.